Every day, hundreds of millions of people are impacted by the global water and sanitation crisis. Together, unsafe water and the inaccessibility of basic sanitation are leading contributors to extreme poverty. Governments, companies, nonprofit organizations, and local communities have made great strides in the past 20 years to put an end to the crisis. Through their efforts, the number of people drinking from ponds, rivers, swamps, and contaminated springs has fallen from approximately 16.5 percent of the global population to just 8 percent , impacting almost 500 million people. Still, 841 million people woke up today without basic access to safe water. We believe the water crisis is solvable in our lifetime, and by working together, we can take one step closer to a world free from waterborne disease. Below is the most up-to-date information from the world’s top data-gathering and humanitarian organizations. Over 579 million people  worldwide are drinking unsafe water from hand-dug wells, ponds, swamps, rivers, and springs. Contaminated water causes disease and even death, especially among children. The majority of people drinking unsafe water, approximately 81 percent, are living in rural, underserved regions of the world. Additionally, 262 million  are drinking what’s classified as safe water, but they are traveling over 30 minutes to fetch it. The World Health Organization (WHO) calls this “limited” access, and it often inhibits children and their families from thriving in their communities. Drinking unsafe water makes people sick, which costs them in health clinic fees, in productive work time, and in their educations. 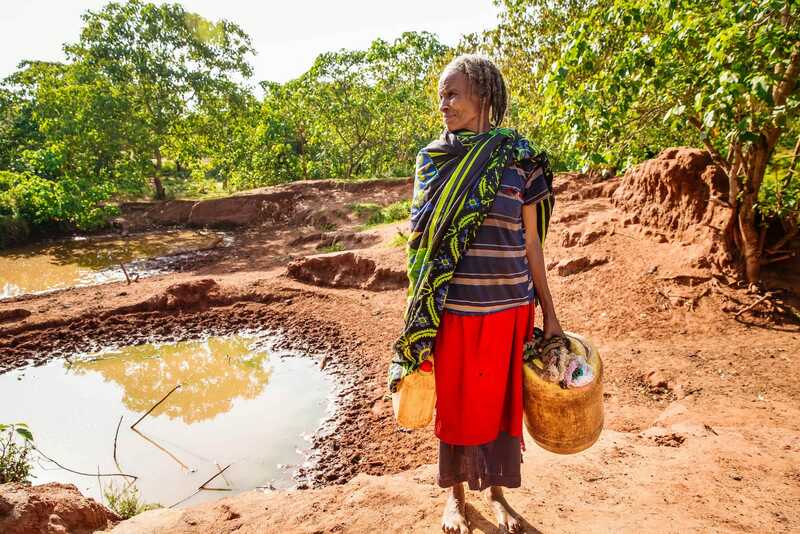 A woman in Ethiopia gathers water from the village pond. Almost one third of the globe , or 2.3 billion people, do not have access to basic sanitation, meaning they are defecating in open fields, forests, or in structures that do not meet basic health standards. Of those 2.3 billion people, 890 million  defecate in the open, one of the most common markers of extreme poverty and a serious health risk for families, especially those with young children. Preventing the death of children is perhaps the world’s most urgent and united mission. 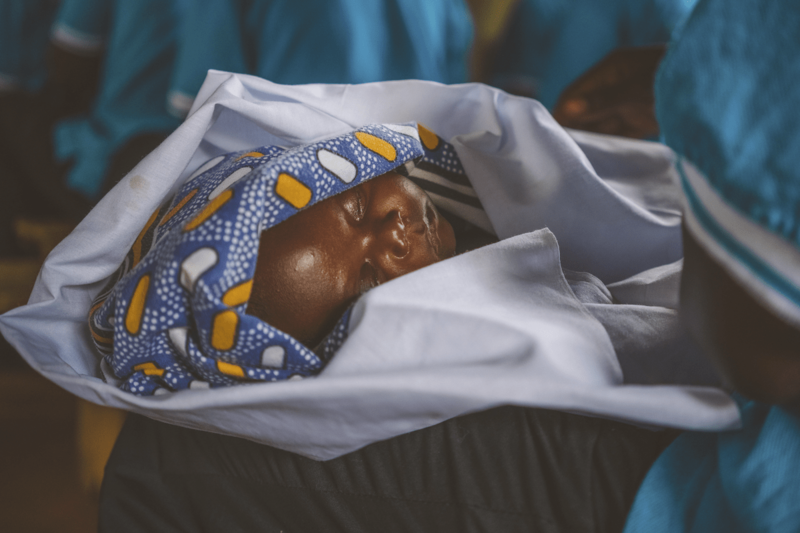 According to Estimates generated by the UN Inter-agency Group for Child Mortality Estimation (UN IGME) in 2018, for every 1,000 children born globally, 39 die before they turn five years old . Most under-five deaths are caused by preventable diseases like malaria, diarrhea, and pneumonia. Contaminated water and poor sanitation and hygiene lead to repeated bouts of diarrheal disease, which contributes to malnutrition, weakens the immune system and makes other diseases more likely. In places like sub-Saharan Africa where the water and sanitation crisis is amplified, 75.5 of every 1,000 children born dies  before reaching his or her fifth birthday. That’s about 1 in every 13 children. A Ugandan child sleeps in a church. Along with the specter of frequent illness and death, children who do not have safe drinking water are more likely to drop out of school. Their parents, weighed down by expensive medical fees, struggle to afford tuition. Saving money becomes nearly impossible, and families in the most rural, hard-to-reach communities find themselves selling their land and possessions to afford treatment for water-related illnesses. Human dignity and potential is suppressed under the weight of a full container of contaminated water, and without safe water and healthy practices, poverty is passed onto the next generation. The good news is, there’s hope in our lifetime. There are many global organizations working to end the crisis through the implementation of WASH (water access, sanitation, and hygiene) programs and the construction of safe water projects. Each year, fewer people wake up with the burden of unsafe water. At Lifewater, our staff work alongside villages, visiting every home to ensure that families learn life-saving health practices and working together to engineer custom, long-lasting safe water sources for every community. Since 2016, generous Lifewater donors have funded over 400 safe water projects, serving 188,766 people with clean water, health, and gospel hope. You can make an impact on the global water and sanitation crisis today. Explore villages in urgent need of help here.